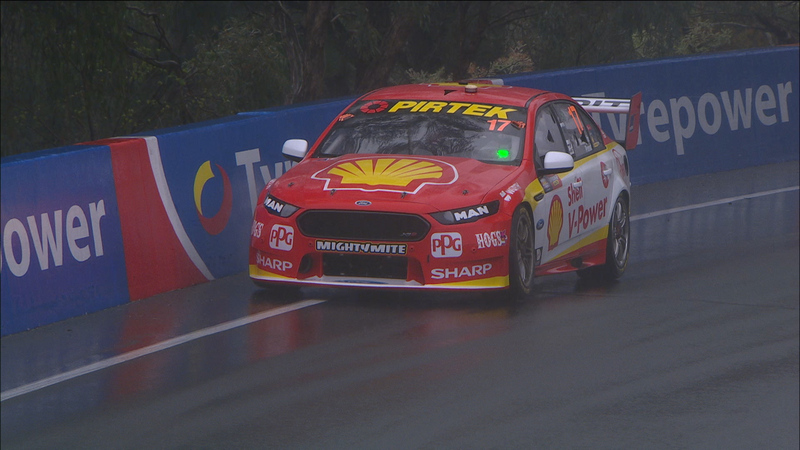 Cameron Waters and Richie Stanaway lead at the halfway mark of a rain-hit Supercheap Auto Bathurst 1000 that has produced heartbreak for Scott McLaughlin. The polesitting McLaughlin entry retired from the race on lap 76 when it suffered an engine failure with co-driver Alex Premat at the wheel. Shell V-Power Racing’s lead entry had been running in the top three when Premat first reported a loss of power on lap 46. Initially told to carry on, he pitted on lap 51 for an assessment during a routine pitstop, and another visit to the lane five laps later for an electrical reset also failed to cure the problem. Struggling for pace, Premat was 11th and over two minutes adrift of the leader when the engine gave up for good, triggering the race’s first Safety Car. 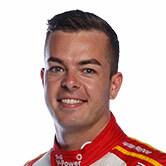 The disaster threatens McLaughlin’s championship lead, which sat at 84 points over Jamie Whincup ahead of the 300-point race. “It’s pretty hard, but we were battling anyway. We were struggling there,” said McLaughlin. Rain arrived just prior to the start and has persisted throughout the first 80 laps, which have taken more than 3 hours and 30 minutes to complete, despite the largely green running. McLaughlin led the first two laps before a trip down the Murray’s Corner escape road dropped him to sixth. Chaz Mostert took over from there, but a difficult subsequent stint for Steve Owen, including a drive-through for having his wheels spinning in the pitstop, dropped the Supercheap Ford well down the order. Conversely, Stanaway proved the star of the show after taking over from Waters at the first round of stops. Running fifth and more than 30 seconds down, Stanaway took little over 10 laps to catch leader Luke Youlden, driving David Reynolds’ Erebus Holden. Running down the Murray’s Corner escape road on lap 37 handed Youlden a 7s advantage, but it took just three more circuits before the Monster Ford was again in front. Stanaway continued his charge and was 17s ahead of Reynolds when he pitted to hand the car back to Waters on lap 67. 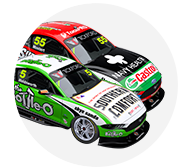 “It’s really difficult conditions out there but the car seems to be working well,” said Stanaway. “Usually in these conditions you’re either fast or you’re not and it was just a matter of settling into a rhythm and seeing what we had. Waters sits just ahead of Youlden at the halfway mark due to the Safety Car just prior to the 500km marker being reached, while the flying Mostert has recovered to third. Whincup/Paul Dumbrell are fourth despite multiple off-track excursions in the tricky conditions. The sister Red Bull entry of Shane van Gisbergen/Matt Campbell is fifth after proving a major beneficiary of the Safety Car. Van Gisbergen charged up to third in the early laps before two horror stints for Campbell that started with a spin after contact from Michael Caruso in The Cutting on his outlap. 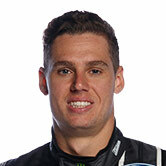 Campbell had a further four offs - one aided by Jonathon Webb - and was lapped by the Monster Ford before handing back to Van Gisbergen, who unlapped himself just prior to the Safety Car. Scott Pye/Warren Luff sit sixth after a strong opening two stints from Luff, who was the only co-driver to take the start in the tricky conditions. The Garry Rogers Motorsport Holdens of James Moffat/Richard Muscat and Garth Tander/James Golding are seventh and ninth respectively, sandwiching the Jason Bright/Garry Jacobson Prodrive Ford. Jacobson ended a sterling double stint aboard the MEGA Fuels Falcon by briefly taking the lead from Waters, albeit a full pitstop behind at that stage. James Courtney/Jack Perkins complete the top 10 in the second Mobil 1 HSV entry, with the top 23 cars all back on the lead lap thanks to the full course yellow. 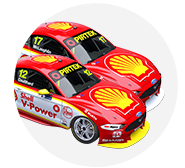 Those to struggle for speed in the wet conditions include the Fabian Coulthard/Tony D’Alberto Shell Ford, which sits 12th, and Mark Winterbottom/Dean Canto Prodrive Ford, down in 14th.